Why Choose Our Memory Foam Terry Indoor Slippers? • The newly developed wrapped around memory foam design can perfectly adapt to the whole shape of your feet. Combined with soft terry lining, it is more comfortable and snug to wear than traditional slippers. • The edge of the slippers adopts newly stitch turn craftsmanship, which is not easy to crack, and are really solid and reliable. • Machine or hand washable, easy to care, ultralight weight. • 100% no risk money-back guarantee. 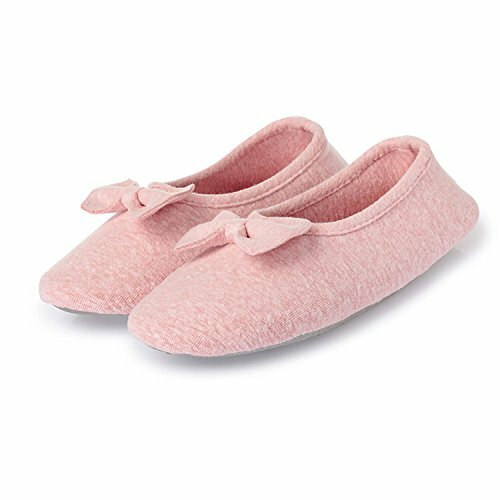 • These terry slippers can be hand or machine washable. • Do not throw them at anyone when you are angry. CUTE & ELEGANT APPEARANCE - In a ballerina design, the slippers feature a pretty and cute bow decoration on the front. The cozy cashmere knitted upper with exquisite cotton trim also adds an elegant touch while the comfortable cotton lining will let you feel like you are walking on a cloud. RELAXED & COMFORTABLE WEARING EXPERIENCE - The knitted vamp sets off feet smooth. The cotton fabric inner lining makes feet relax. Your feet will love to stay in these slippers because they provide softness, comfort and quiet. It is suitable for wearing at home in normal times. It is also great for office, travelling hotel and other indoor environment. PERFECT EVERY-DAY SLIPPER & GIFT CHOICE - With memory foam insole and classic ballerina style, these slippers can conform and flex with your feet and fit securely for your active lifestyle. You can also feel safe wearing them on wood or tile floors because of the non-slip outsole. Share these slippers with families or friends, they will be great gift choices for you. MULTIPLE OPTIONS & EASY MAINTENANCE - Available in 5 popular colors. Due to multiple sizes and elastic material, these stylish house shoes fit most standard foot sizes. They are both hand and machine washable. SATISFACTION GUARANTEE - With L-RUN, you're taking no risk with your purchase. We offer a 100% no risk money-back guarantee if you're not thrilled with your purchase for any reason. Just tell us and we will do our best to give you the most satisfactory solution. Please check our L-RUN storefront for more slipper styles and other deals that are waiting for you!